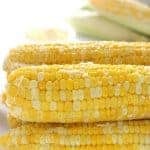 If you are looking for the best Instant Pot Corn on the Cob, this one is it. It’s creamy, sweet, and delicious. You will find it super easy with simple ingredients. Set time to 6 minutes, pressure to high, delay to off and keep warm to off. It will take several minutes to reach pressure and then will cook for 6 minutes. After cooking is complete, allow pressure to release naturally (10-15 minutes).